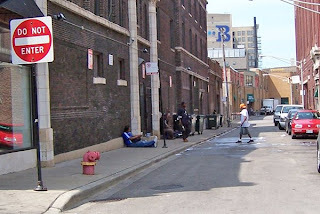 Uptown Update: "'Blood Alley' Still a Problem in Uptown"
"'Blood Alley' Still a Problem in Uptown"
The focus of last week’s meeting at Harry S. Truman College was the ongoing problems of safety and appearance around the two-block avenue between Broadway and Wilson Avenue." Read all about it here - reactions from the alderman, Uptown United, business owners in the area and the police. "...it is so much more localized, it used to be everywhere"
She is stuck in her own alternate reality. Funny how the people in that group seem to parrot her talking points: it's better than it was, it's more localized now, they're not hurting anyone, they don't live here, etc. Nothing ever changes around here. A couple of other neighbors and I were invited to attend this taskforce meeting. (This is actually the 3rd time this year we’ve met as a taskforce.) We had a chance to share what we were personally witnessing and give a clearer understanding of the issues facing the community. While some hinted that these people were gathering to socialize, many of us expressed a concern that it goes well beyond that, and given the number of drug transactions witnessed, the recent drug-related arrests, and 38 bags of crack seized from the Wilson Men’s Club last August, we might be witnessing an active drug trade going on. 1. Have plans in place to remove the dumpsters off the sidewalk. Some people hide by the dumpsters when they do some of their illegal activity. 2. Strengthen a plan to have this avenue kept cleaner, including disposing of milk crates, mattresses, and chairs from that avenue as quickly as they appear. These items encourage loitering when left out. 3. Have a couple of outside agencies assess where these loiterers were receiving social services. These agencies will be asked to seek more accountability from their clients. 4. Have the Police continue monitoring the area and make arrests as indicated. The problem may be more localized, but it’s also become more serious as of late. Localized or not, what we’re seeing is still not satisfactory. During the 10+ years I’ve lived in Uptown, many of us have viewed this corner as Ground Zero, but roadblocks have hampered our efforts to address them. On the bright side, I see more positive steps being taken now and I’m sensing a greater commitment to resolve them. It’s becoming clearer that the community is more organized and insistent that this issue be taken more seriously. The sooner we get new leadership the better this community will be. I believe it was stated in a different post after gun shots rang out by one cop collecting shell casings "You get rid of Shiller and all this goes away". Balloon juice, the lot of it. This area's been problematic since ... what ... the 60's?! Look at all of the things accomplished in the last 40+ years and someone, please, tell me why it is that we can (repeatedly) put men on the moon in less than a decade, and the collective genius at play in this task force can't clean up one d@maned corner. Cap didn't detail the "road blocks" mentioned, but one could safely assume them to be a mix of political protectionism, avoidance of accountability, incompetency and simple lack of will. The best word to describe this situation is "shameful". How about simply making this a two way street so that more traffic is encouraged? And by more I mean some. more traffic, more eyes. More eyes, less places to hide. Marc, I think when Racine is changed to a one-way northbound street that Clifton, a southbound street, will be much busier. Bad for kids playing in the street, as they do, but good from a "more eyes on the street" perspective.